YELLOWSTONE NATIONAL PARK, June 2, 2015 (ENS) – An Australian man, 62, sustained serious but non-life-threatening injuries after an encounter with a bison near Old Faithful Lodge in Yellowstone National Park around 11 a.m. today. Witnesses report that several people were crowding a bison that was lying on the grass near an asphalt path, when the man approached the bison, taking pictures with an electronic notepad. He got to within five feet of the bison when it charged him, tossing him into the air several times. When rangers responded on scene, the bison was about 100 yards from the victim. The victim, whose name has not yet been released, was transported to a ground ambulance and then taken by helicopter for further medical treatment. 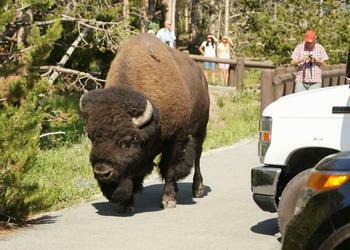 It is the second time in three weeks a bison has injured a tourist in the park. A bison in the Old Faithful area gored a 16-year-old exchange student from Taiwan as she posed for a picture near the animal on May 16. The National Park Service said in a statement, “The girl turned her back to the bison to have her picture taken when the bison lifted its head, took a couple of steps and gored her.” The girl was helicoptered to a hospital for treatment. The Park Service today reminded visitors that “Yellowstone wildlife is wild.” Wildlife should not be approached, no matter how tame or calm they appear. When an animal is near a trail or boardwalk, visitors should not approach closer than the recommended safe distances: 25 yards (23 meters) away from all large animals – bison, elk, bighorn sheep, deer, moose, and coyotes and at least 100 yards (91 m) away from bears and wolves. ANCHORAGE, Alaska, June 2, 2015 (ENS) – Twelve environmental groups today announced their intent to bring a new challenge to the Bush-era Lease Sale of 30 million acres along the Chukchi Sea’s outer continental shelf for oil and gas drilling. The public interest environmental law firm Earthjustice today informed the Alaska federal district court of the groups’ challenge to Chukchi Lease Sale 193. The sale, originally rushed through in 2008 by the Bush administration and justified once in 2011 by the Obama administration, was based on poor science and arbitrary economic assumptions, the groups claim, a position that has been upheld in court. In January 2014, the Ninth Circuit Court of appeals ruled that the Chukchi Lease Sale 193 was held unlawfully, the second time the offshore oil and gas sale was sent back to the Department of the Interior by the courts. In reassessing the environmental effects of the lease sale, Interior reported a 75 percent chance of one or more major oil spills if the leases are developed in the Chukchi Sea. Still, the agency affirmed the lease sale, and Shell plans to start drilling as soon as July. The groups claim that the Department of the Interior’s decision to affirm the lease sale “poses unacceptable risks to the Arctic and the planet” and is contrary to President Barack Obama’s commitment to limit the worst effects of climate change by meeting the two degree Celsius cap for warming agreed to by the world’s governments. “There is no way to contain or clean an oil spill in Arctic Ocean conditions, and a spill could have catastrophic consequences for the people and wildlife of the region,” the groups reiterated today. Drilling activities under the lease sale threaten essential habitat for the imperiled Pacific walrus population and other wildlife in and around the food-rich, fragile Hanna Shoal. The groups maintain that shrinking sea-ice cover already has limited the walruses’ access to food, and drilling can cause the sea mammals to move away from their remaining foraging areas. “Permitting new drilling in the Arctic Ocean comes with a 75 percent chance of an oil spill, and a 100 percent chance of worsening our climate crisis. This ‘double-whammy’ would be disastrous for endangered marine mammals such as walrus and whales,” said Dan Ritzman, Alaska program director for Sierra Club’s Our Wild America campaign. The plaintiff groups are: the Alaska Wilderness League, Center for Biological Diversity, Friends of the Earth, Inupiat Community of the Arctic Slope, National Audubon Society, Natural Resources Defense Council, Northern Alaska Environmental Center, Pacific Environment, REDOIL (Resisting Environmental Destruction on Indigenous Lands), Sierra Club, The Wilderness Society, and World Wildlife Fund. WASHINGTON, DC, June 2, 2015 (ENS) – The first three solar energy projects to be approved under the streamlined permitting process of the Bureau of Land Management’s Western Solar Plan were announced Monday – all in Nevada. The new projects – Invenergy’s Harry Allen Solar Energy Center, First Solar’s Playa Solar Project, and NV Energy’s Dry Lake Solar Energy Center – were submitted for approval by the three successful bidders to a competitive auction BLM held on June 30, 2014. They netted $5.8 million for solar leasing on parcels of public lands in the Dry Lake Solar Energy Zone. The auction was part of the competitive leasing process required for solar energy zones under the terms of the Western Solar Plan. When built, the three solar energy projects on public lands in Clark County, Nevada, will generate up to 440 megawatts of energy – enough electricity to power roughly 132,000 homes. They are expected to create up to 1,900 construction jobs. The Western Solar Plan allows for a more efficient and predictable permitting process by focusing development in solar energy zones with the highest resource potential and lowest conflicts. The expedited reviews of these three projects were completed in 10 months, less than half the amount of time it took under the previous project-by-project system. Under the Western Solar Plan, the BLM has designated 19 Solar Energy Zones covering more than 298,000 acres of public land. If fully developed, projects in the designated leasing areas could produce as much as 27 gigawatts of solar energy – enough to power about eight million homes. HONOLULU, Hawaii, June 2, 2015 (ENS) – The the U.S. Navy and the Defense Logistics Agency must minimize the threat of future leaks at the Red Hill Bulk Fuel Storage Facility near Pearl Harbor, the site of a 27,000 gallon fuel release last year. With a total capacity of 250 million gallons, Red Hill’s underground fuel storage tanks are the largest of their kind in the world. A new agreement with the U.S. Environmental Protection Agency and the Hawaii State Department of Health commits the Navy to install improved technologies for fuel release prevention and detection at the facility. EPA and the Hawaii Health Department will approve all work performed by the Navy, and monetary penalties may be imposed in the event the work is not conducted as agreed. “This agreement will ensure the safety of Oahu’s drinking water supply, while allowing the Red Hill tanks to remain in use as a resource for our national defense,” said Jared Blumenfeld, EPA’s regional administrator for the Pacific Southwest. “EPA and the Department of Health will remain vigilant during this long-term effort to protect the public health and Hawaii’s precious aquifers,” he said. Constructed in the 1940s, Red Hill consists of 20 underground steel fuel storage tanks built into a mountain hillside. Each tank is 250 feet tall and 100 feet in diameter, and is encased in a minimum of 2.5 feet of concrete surrounded by basalt bedrock. Each tank has a fuel storage capacity of 12.5 to 12.7 million gallons, giving the facility a capacity of 250 million gallons. The agreement requires the Navy and DLA to conduct an analysis of the hydrogeology of the area surrounding the Red Hill facility, study the extent of contamination caused by previous fuel releases, evaluate potential cleanup methods, and assess the risk the facility poses to Oahu’s drinking water resources, all within the next two years. Upon the completion of hydrogeological modeling, additional groundwater monitoring wells may be installed between the Red Hill tanks and the Honolulu Board of Water Supply’s drinking water wells. A feasibility study, to be submitted within two years, will look at a range of tank upgrade options. Each of the massive underground storage tanks that are in service will be upgraded in phases over the next 20 years. A 30-day comment period begins June 1. A public hearing will be held June 18 at Moanalua Middle School at starting at 6:30 pm.